Even the sun was out today at Strathclyde Park in Glasgow for the flawless show that Nicola Spirig had prepared for the European Championships. 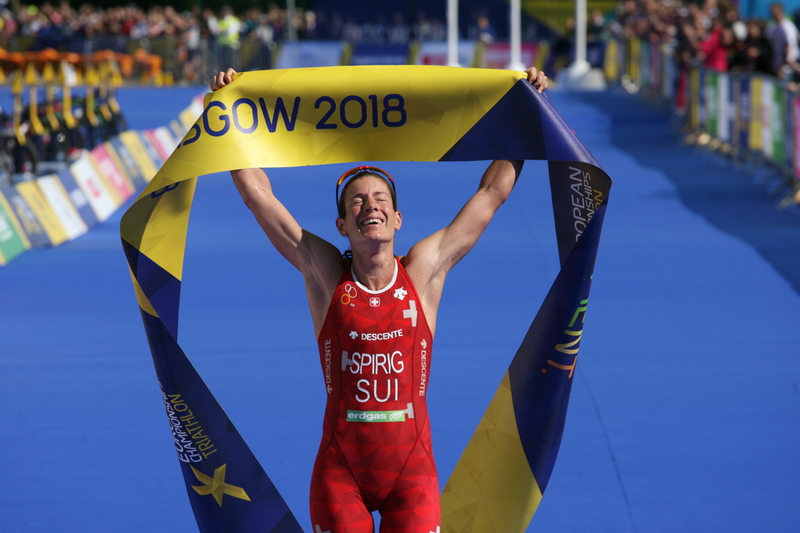 The Swiss, one of the oldest competitors in the field, impressed everyone to claim the European crown again, the sixth of her career, proving that she is serious when she announced that she wants to go for another medal in the Tokyo 2020 Olympics. British Jessica Learmonth crossed the finish line in second while Cassandre Beaugrand (FRA) finished in third place. The race started with Learmonth leading the 1500m swim from the first strokes, proving that she is one of the strongest swimmers in the field. 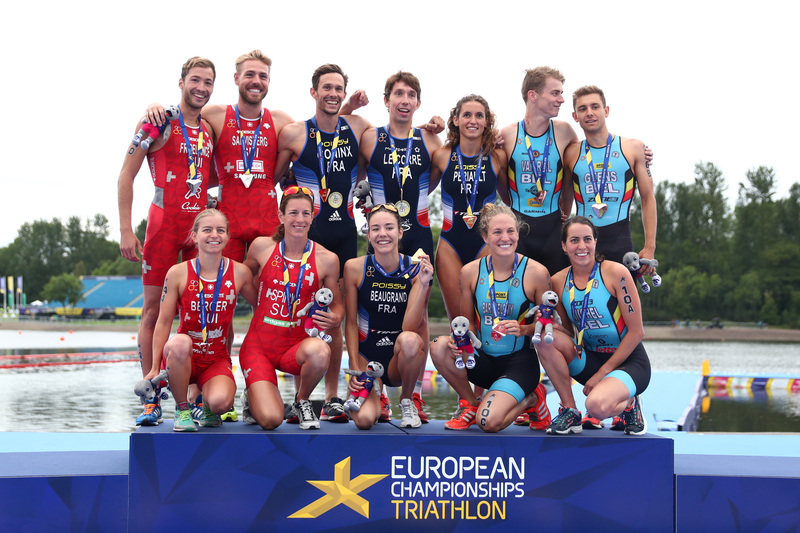 While in the first lap she was followed by a group of three swimmers -Beaugrand, Sara Perez Sala and Anna Godoy Contreras-, in the second lap the quartet became a duo, with Learmonth and Beaugrand the only ones in front. 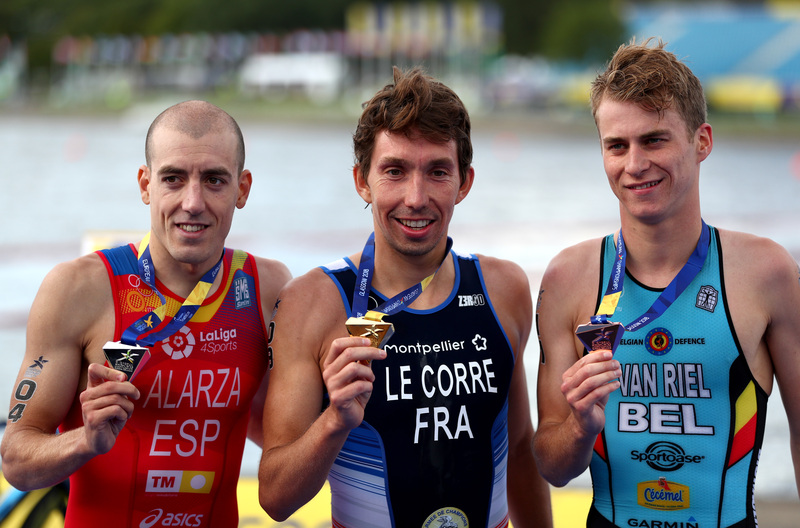 Learmonth and Beaugrand exited the water together, with the two Spaniards 24 seconds behind them, and with a difference of almost 50 seconds with the large group of chasers, including Nicola Spirig. And off they went together while behind them a small group was immediately formed, but a crash involving Perez Sala, Angelica Olmo (ITA) and Lotte Miller (NOR) changed quickly the setup, with Spirig deciding to go solo to chase the British and the French. It was a matter of a few kilometers for Spirig to show her cycling power, even when riding completely alone, decreasing the difference with the leaders lap after lap. With one lap to go, the Swiss managed to rejoin the duo and attacked, to be followed only by Learmonth. 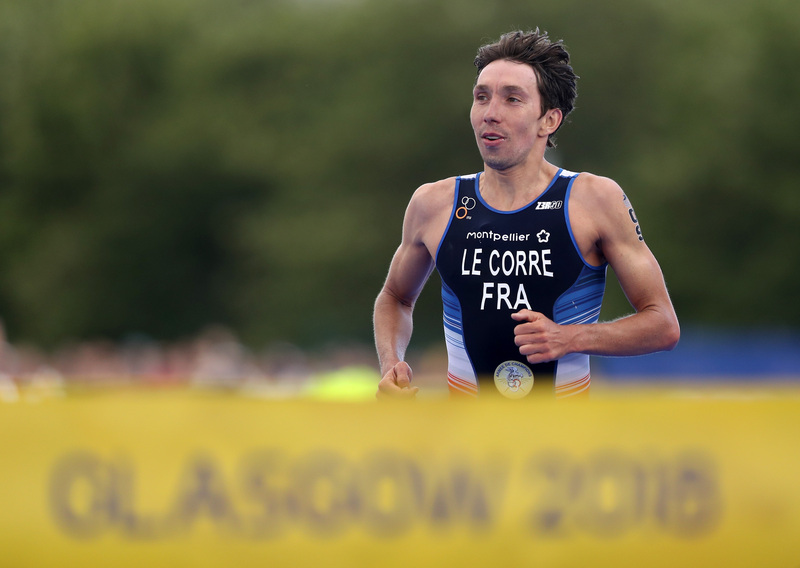 By the end of the 40km leg, Beaugrand was 1 minute 57 seconds behind. With the race clearly looking as a three-persons game, the chase pack included really strong names such as Laura Lindemann, Claire Michel, Anna Godoy and Vendula Frintova. And right after the second transition, Spirig took control of the run leaving Learmonth in her wake. She proved that at 36 years old, after a 20-year career, two Olympic medals, five European golds and two children, she still has surprises up her sleeve. Behind them, Beaugrand looked too tired to try to chase them, and focussed her efforts on just crossing the finish line. 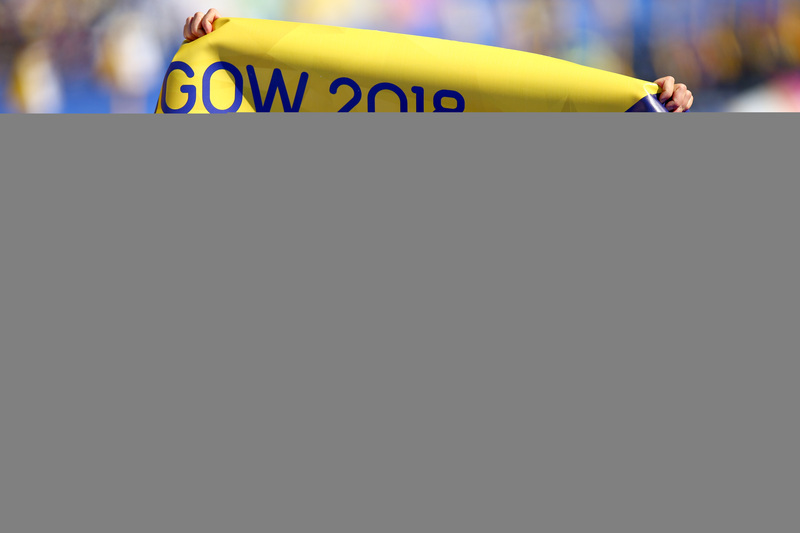 By the end of the 10km run under the Scottish sun, Spirig was all smiles when crossing the finish line to grab the sixth european title of her career, after the ones she got in 2009, 2010, 2012, 2014 and 2015. Learmonth stopped the clock in 1:59:46, 33 seconds behind Spirig, to add a silver medal to the gold she got last year in the Europeans. And in third place came Beaugrand, followed by Lindemann in fourth place. With Claire Michel and Vendula Frintova finding out the strength to sprint to the finish line for the 5th and 6th place respectively, the top ten was closed with Julia Hauser (AUT), Kaidi Kivioja (EST), Petra Kurikova (CZE) and Melanie Santos (POR). “It feels amazing. I’m really happy. I had huge support from my husband, my whole family and my whole team”, said Spirig after crossing the finish line. 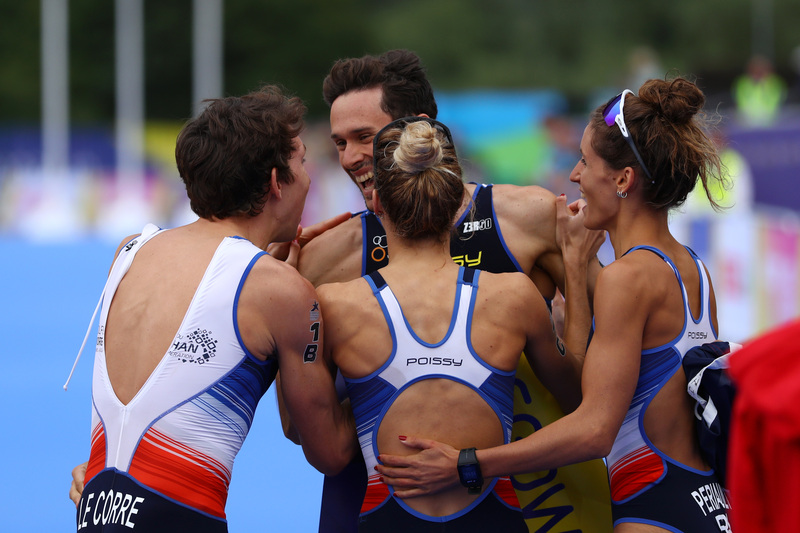 “There were a few key moments, I came out of the water 40 seconds down, but that wasn’t a problem for me. I felt it was doable. I knew that I would be stronger in the second part of the bike stage compared to the others. I knew I’m probably stronger in the second part. I was lucky because there was a little bit of a crash behind me, so I was by myself from the beginning. 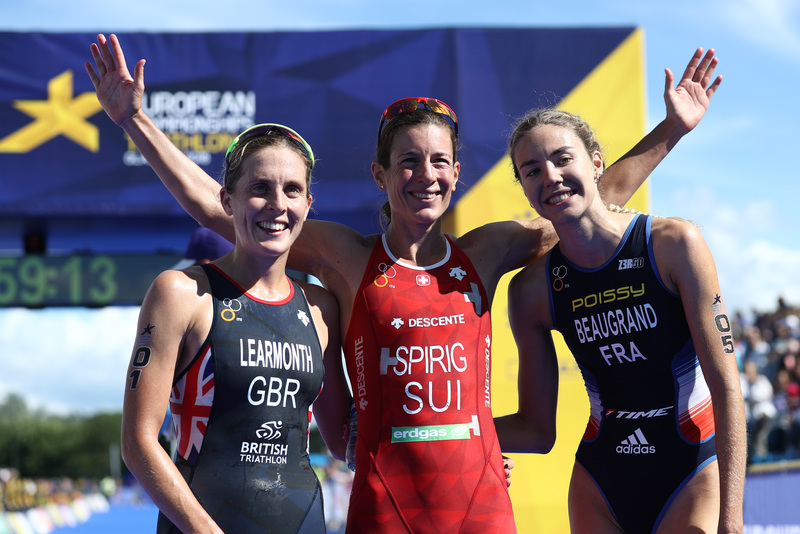 I could just concentrate on the leaders without worrying about taking turns (with other riders).It was a key part when I caught up with Jess and Cassandre , I attacked straight away,” said the Swiss, who at 36 and mother of two young kids, is again racing at top level at the ITU circuit. “I never thought I was gonna be still doing this at my age. Never. I was just taking it one step at a time. I always wanted to stop at 30, but now I’m six years past that and I’m still winning and still enjoying it a lot,” she stated. The race was a killer one, even for the top athletes. “That’s a hard course, definitely. I struggled at points but I’m delighted with second”, said silver medallist Jess Learmonth. 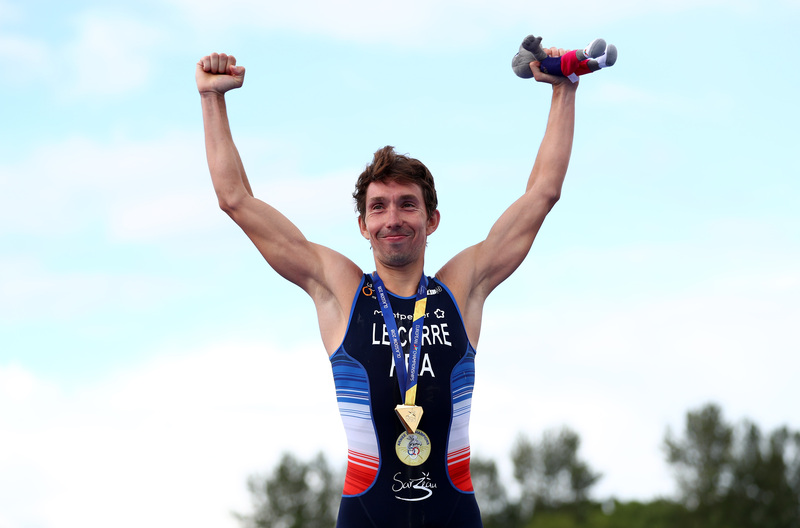 “I was the swimmer, Nicola was the rider and Cassandre was the runner. I knew I’d struggle today, out front on my own. Nicola is extremely strong and once I knew she was catching I just thought I’d ease up a bit and I knew she’d want to get rid of Cassandre so I was just ready for the jump and just then she made a little attack. Both of us didn’t realise that she’d dropped. I looked around and thought, ‘Oh, she’s gone, so we’ll crack on’, so off we went”, she commented after the race. Beaugrand was really happy with her performance, even though she struggled at some points of the race. “It was a very difficult race and not really my preferred race profile. I tried to push, push. I had a really tight race with Jessica which I don’t normally do, because I’m less strong on the bike. I really had trouble on the run leg, at least I was not at my normal level, but I kept my position,” she said. “The first thing Jessica and I said to each other when Nicola chased us was ‘s**t’. We saw we had a 10-second lead on the hill, and then we lost it straight away because she attacked”, she recalled.